Believe it or not, I am still sorting and sifting through the cards we busted during the regular season! Holy smokes! I did not realize how many cards were still waiting to be handed out to their respective owners. Just when i thought I was getting close to done, I found another 800-count box that I thought was empty. Let's just say it'll be a at least a week or so before I start shipping these out. While sorting, I did make a discovery or two. First, somehow Javier Vasquez was assigned to both Dayf and Jafronius. Dayf is the actual owner, according to the draft cycle. Second, I have several players that seem to have dodged the draft completely. Third, there were more than 100 players still left unclaimed after the last draft. What's left to do? Let's enumerate, shall we? 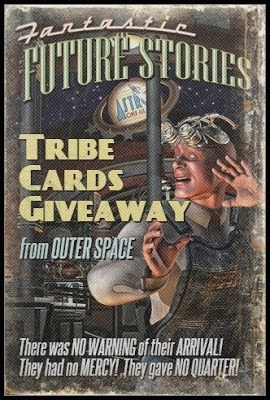 Oh, speaking of packaging: Anyone that scored over-sized cards will receive at least two Tribecards from Outer Space packages. One will be a box (or boxes) of standard cards, and the other will be a mailer with the over-sized cards. Enjoy!